Taipei, Taiwan, June 17th 2011 – GIGABYTE TECHNOLGY Co. Ltd., a leading manufacturer of motherboards and graphics cards, today announced the new revision 3.1 GA-M52LT-D3P, GA-M68MT-D3P and GA-M68MT-S2P motherboards now offer AMD AM3+ CPU support, providing users with an entry level solution that will still be able to take advantage of upcoming AMD FX series processors. "GIGABYTE continues to provide its customers with options for theirmotherboards, including high-end CPU compatibility with entry level motherboards, because in our experience there are customers out there who need this combination," commented Henry Kao, VP of Worldwide Service and Marketing at GIGABYTE. "In addition to bringing our signature GIGABYTE features such as Ultra Durable 2 Classic, 4+1 phase VRM support, On/Off Charge and 3X USB Power to mainstream and entry level segments, now users can also be assured that their motherboard is able to take full advantage of all the performance enhancements that AMD's upcoming AM3+ CPUs have to offer." GIGABYTE AM3+ motherboards feature the new AM3+ socket which support the forthcoming high performance AMD FX series processors, the first ever consumer oriented processors to feature up to 8 native processing cores, enabling incredible performance in processor-intensive applications like video editing and 3D model rendering with unrivalled application multitasking. GIGABYTE AM3+ motherboards also incorporate the new AM3+ ‘Black Socket' which signifies support for AMD's upcoming FX series processors, as well as backwards compatibility with AMD AM3 based Phenom II and Athlon II processors. The AM3+ ‘Black Socket' also features more efficient power loading and improved heatsink mounting. GIGABYTE was the first motherboard manufacturer to realize the importance of using only the highest quality components for the critically important CPU VRM zone of the motherboard which is responsible for delivering stable power to the CPU. The GIGABYTE Ultra Durable™ 2 Classic design utilizes Solid Capacitors manufactured in Japan which are rated to last for at least 50,000 hours in operational use and also Lower RDS(on) MOSFETs which feature lower resistance, i.e. reduced power consumption and heat. 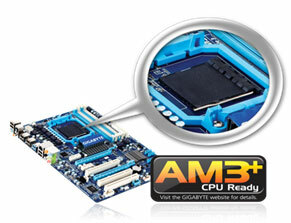 These latest AM3+ motherboards feature a Split Power Plane design, with 4+1 phase VRM. This allows for more stable power delivery to the CPU, as well as help smooth out power ripple and noise which is important for clean CPU power delivery. GIGABYTE motherboards feature a 3x USB power boost, delivering greater compatibility and extra power for USB devices. GIGABYTE's unique USB power design is also able to efficiently regulate output over the full voltage range, which greatly enhances USB device compatibility. In addition, dedicated lower resistance fuses ensure lower voltage drops, and provide more stable and plentiful power delivery. Thanks for the feedback. My motherboard has an AM2+ socket and I'm wondering if an AM3+ CPU would work?